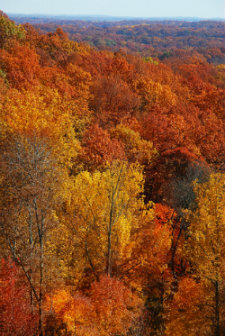 With the kids comfortably settled into a new school year, the beautiful Indiana foliage turning the landscape a stunning orange-red hue, and the crisp, frosty mornings of autumn crunching beneath your feet, it’s the perfect time for you and the family to enjoy all that Indiana Fall Festivals and Fairs have to offer. Nothing says autumn in Indiana like a good old fashioned hay ride through a corn maze. Strap the kids in the car and head on out to Pumpkinfest at The Country Market just north of Indianapolis in Zionsville. Every weekend in October offers the chance to enjoy live bluegrass and mountain music, sample some fresh country cider, get up close and personal with a farm animal or two, or decorate a pumpkin. If you’re looking for a unique way to view the autumn color, consider taking a historic train ride through the Hoosier National Forest on the French Lick Scenic Railway at the Indiana Railway Museum. Highlights include the 2200-foot Burton Tunnel, magnificent limestone rock cuts, and of course, the natural beauty of the Hoosier National Forest. Get out there and enjoy everything that autumn in Indiana has to offer before the snow flies!